Jennifer - 1966 - CPA in Beavercreek, OR. 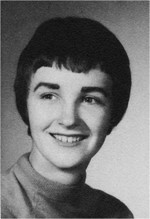 Rebecca - 1969 - Widowed - lives inConcord, CA. Kate More…- 1973 - Divorced- 1 darling daughter - Graphic Designer inDanville, CA. I am now a widow and a cancer survivor (five years plus). I retired from being an Office Manager for a local hospice in 2009. One of the the things that has happened in my life that I would have never expected was that I was asked to design and make stained glass windows for a Pleasanton church. It was quite an experience. Started Foothill Junior College but left when I left home and started working. After years of being home I did take a re-entry class designed to "get mother's back into useful society". Loved that description. I got to hold a baby lion cub on my chest while being a the zoo with my kids. They would not look at it because they were riding a tortoise. Sigh! walk our dog rescue dog, Romeo, because he will lick you to death (we did not name him), spend time trying to keep up with our granddaughter, Riley. Nope, did not finish junior college because I had to start working. Spent years sewing for my three daughters and now am working a a quilt for my granddaughter. I did not set any other goals back then. Lew and I were already planning to get married. Judie Iverson Reed has a birthday today. Judie Iverson Reed has left an In Memory comment for Bill Schulte. Judie Iverson Reed updated profile. View. Judie Iverson Reed has a birthday today. New comment added.